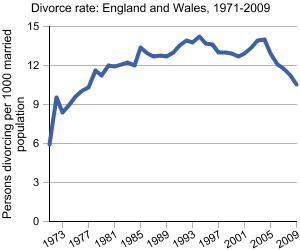 The Relationship People's Blog: What's the true story behind divorce statistics? 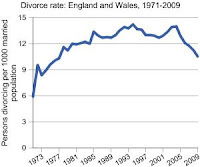 While the number of couples choosing to divorce may slowly be falling, the statistics don't do justice to the amount of pain and anguish felt by the individuals involved. People worry about the financial cost of divorce, the effect on their children and the wider family, the change of living arrangements and loss of lifestyle. In my view the greatest cost of divorce is emotional and in line with the loss felt on the death of a close relative. In this case the mourning is for the relationship that might have been. The thought we may never find someone to share our life with. For some that potential loneliness stretches out into a bleak future. 'Marriage is for life', we’re taught, otherwise why bother getting married? So when it doesn’t last a lifetime, it seems only natural someone must be to blame. Maybe I should have spoken up earlier? Maybe I should have seen it coming? Maybe I was too passive? Too busy? Maybe I’m just useless at relationships. They see being divorced as a badge of failure, bringing with it poor self-confidence and low self esteem. Others take the opportunity to punish the other person – it must be all their fault: She’ll pay for the way she treated me….I haven’t forgotten what he said …. This only escalates the anguish and gets me on my soapbox because it doesn't have to be this way! It is possible to reduce the emotional cost of divorce by encouraging people to realise that accepting help at this difficult time is sensible, is rapidly becoming normal and, far from failure, is a way of helping people to get back in charge of themselves and their lives. One of the most uplifting aspects of our work is when couples are referred to us because they aren’t sure whether or not they want to separate, but do know they can't go on like they are. We encourage couples, who fear they are drifting apart, to look again at what they already have - because it may well be their love hasn't yet died and with attention they can bring it back to full health. There's no short cut to a long term relationship! There is a small window of opportunity for people going through divorce, when the pain they are experiencing leaves them more open to change. This is a really great time to rebuild confidence and self-esteem. Many couples realise they both had their own part to play in the breakdown of their marriage. With their eyes on the future they may also be ready to take action so they don’t make the same mistakes again. Don't want to be one of the statistics?